*Consumer Guarantee: If for any reason you are not satisfied after using this product, simply send us original proof of purchase and we will refund the purchase price. 5.4lb covers 1000 sq. ft.
13lb covers 2420 sq. ft.
Sprinkle around plants at a rate of 3/4 oz. (2 Tbsp.) per 10 sq. ft.
Activate product by lightly watering-in. This product may be raked into the top inch of soil before watering-in. This product is not for use on lawns or vegetable gardens. Do not use when planting seeds. Do not treat plants grown for food or feed. Apply to soil around plants in Spring before weeds germinate and before mulching. Wash granules from plants and activate product by lightly watering-in. Apply once every 12 months. Apply after planting and watering the area to pack soil around roots. * Note: Established plants are those that have been planted for more than 2 weeks. Guaranteed results or your money back. If for any reason you are not satisfied after using this product, simply send us the original proof of purchase and we will refund the purchase price. - Make sure newly planted areas have been watered and soil is packed around roots of desirable plants before applying this product. - Keep product off of plant leaves. If product is applied to the plant leaves, rinse the leaves with water. - Avoid unintentional contact of granules with stone, wood, or other porous surfaces as staining may occur. Sweep immediately to avoid staining. If granules are crushed into surface, rinse thoroughly. - Unusually cold, excessively wet, or hot and dry conditions that delay germination or extend germination over a long period of time can reduce weed control. - To prevent possible staining to unintended surfaces, ex. : concrete, stone walks, vinyl surfaces, etc., sweep up stray granules as soon as possible. - Not for use on edible fruit, vegetables or herb areas. PESTICIDE STORAGE: Store in a dry place for your next application. Product can be used until container is empty. Do not apply this product in a way that will contact any person or pet, either directly or through drift. Keep people and pets out of the area during application. Do not allow people and pets to enter the treated area until dusts have settled. Do not enter or allow others to enter treated areas until watering-in is complete and the soil surface is dry. 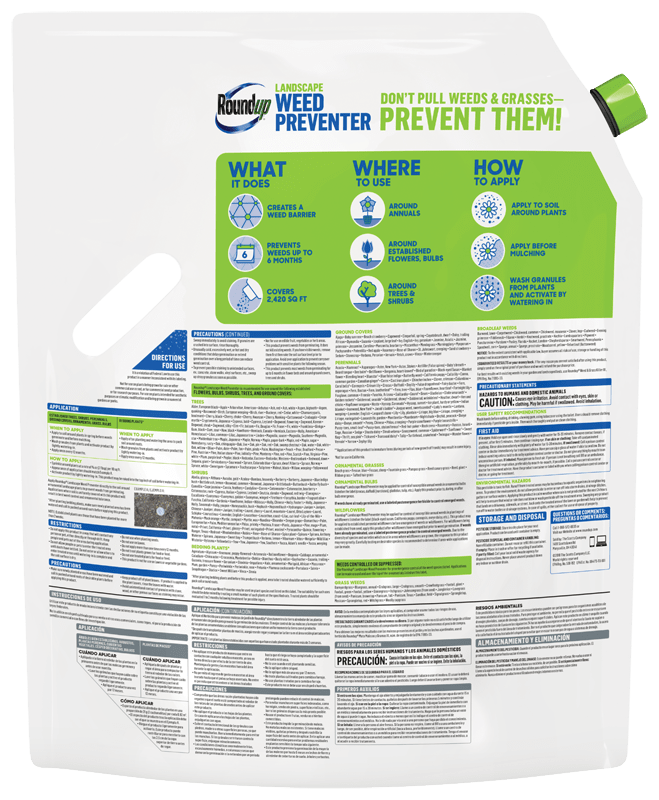 This product prevents weeds from germinating. It does not kill existing weeds. For best results with existing weeds in your garden and landscaped beds, use Roundup® Weed & Grass Killer III. After application, wash granules from plants and activate product by lightly watering-in. 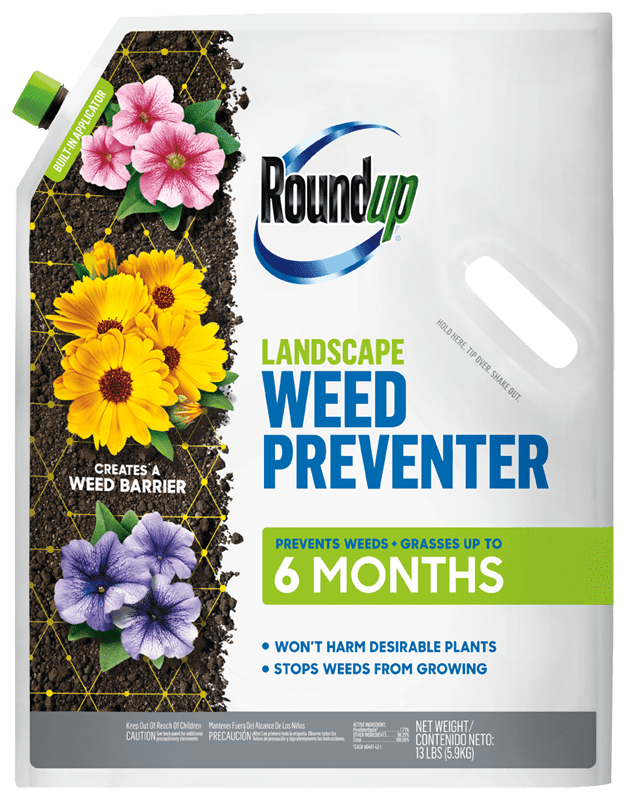 This product prevents most weeds from germinating for up to 6 months in flower beds and around ground covers, trees and shrubs.